From child custody to alimony, there are many aspects that may require consideration when a couple is going through an overwhelming and emotionally distressing divorce. One of the critical parts of a divorce is division of marital equity under the Illinois Marriage and Dissolution of Marriage Act. However, it can be extremely challenging to determine fair value on fluctuating real estate market. How Does Property Division Work? The method of property division varies from one case to another. In some instances, spouses agree to sell their home and equally split the sale proceeds, while in other cases, one spouse may want to keep the property by purchasing it from the other spouse. If spouses mutually agree to sell their property, the division gets relatively simpler as the sale proceeds, after deduction of selling fees and other costs pertaining to the house, the remainder is made available to be divided equally or a proportion agreed to by a couple or as per discretion of the court. 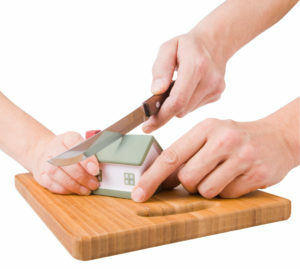 However, in an event where one spouse is keeping the home, it can get complicated. If a house is purchased on a mortgage, the spouse who is keeping the property may have to refinance the terms of mortgage. This may become problematic if they have a bad credit rating or a low level of income. In both cases, they may have no other option but to sell off the house. This situation may get even worse when the house is on the brink of a short sale or a foreclosure. Regardless of the circumstances, it is imperative to determine a fair value of marital equity in order to fairly and justly settle equity. It can be achieved by subtracting remaining mortgage payments and selling costs from the value of their home. Valuation of the house requires complicated financial calculations; therefore, they may be conducted by a professional realtor or a property evaluator. It can be highly beneficial for your case to hire an experienced equity division lawyer. They can guide you through the process of equity settlement and help you find an optimal solution pertaining to issues affecting your equity. Moreover, in case of a mortgage refinancing, your attorney can use their persuasion skills and comprehensive knowledge of laws and regulations to renegotiate financial terms with your lending institution in a much effectual way. For further information about issues pertaining to equity division in a divorce or to schedule a free consultation, contact Law Office of Fedor Kozlov at 847-241-1299 to speak with an experienced asset division lawyer on this topic.